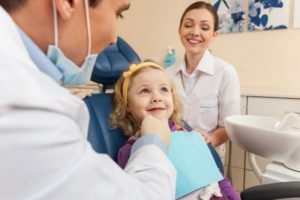 Should I Get Dental Sealants from a Dentist in Ann Arbor? As a parent, one of the things that you’re best at is worrying about your child. Did they get enough sleep? Are they playing too roughly at the park? Will they have cavities the next time their dentist in Ann Arbor checks their teeth? If you find yourself always worrying about your little one, your dentist can help take a little stress off your mind when it comes to their smile by offering effective preventive services like dental sealants. Learn all about dental sealants and how they can help your child keep their smile strong for years to come! One of the biggest threats that your child is up against is tooth decay and cavities. Their little smiles are susceptible to decay and developing cavities because all little kids love sweets! Their young teeth are still developing and will leave behind the foundation for their adult teeth, so it’s important to protect them as much as you can now. Dental sealants work to do just that! With sealants, your child’s teeth will be protected from leftover food, dental debris that can cause tooth decay, and bacteria that can find the intricate crevices of your little one’s smile. These sealants are crafted from a high-quality dental material known as composite resin. Your dentist will use the material to fill the pits and crevices of your child’s smile, especially in the back teeth. Sealants create a smooth surface that’s easier for you to clean as well, optimizing their oral health. As mentioned above, it’s important to care for children’s smiles from the time they are young. Keeping dental problems far from your child’s smile can help preserve their smile for years to come and create a stable foundation for their permanent adult teeth to develop. Your children’s dentist is here to help their baby teeth develop into strong, permanent pearly whites! Here at the dental office of James Olsen, DDS, we take pride in helping all patients—even the little ones! Since we’re invested in taking the best care of your smile, we will discuss preventive services like dental sealants and even fluoride treatments for your child. Call us today to schedule their next preventive appointment. Comments Off on Should I Get Dental Sealants from a Dentist in Ann Arbor?